When a user adds a new phone contact, it will also be saved and can be viewed in the user panel. All the information, including name, phone number and e-mail (if provided by the user) is also saved. It is a default feature, so you don’t have to change any settings. In some cases, the contact details are sent to the user panel with a bit of a delay – you just have to wait. 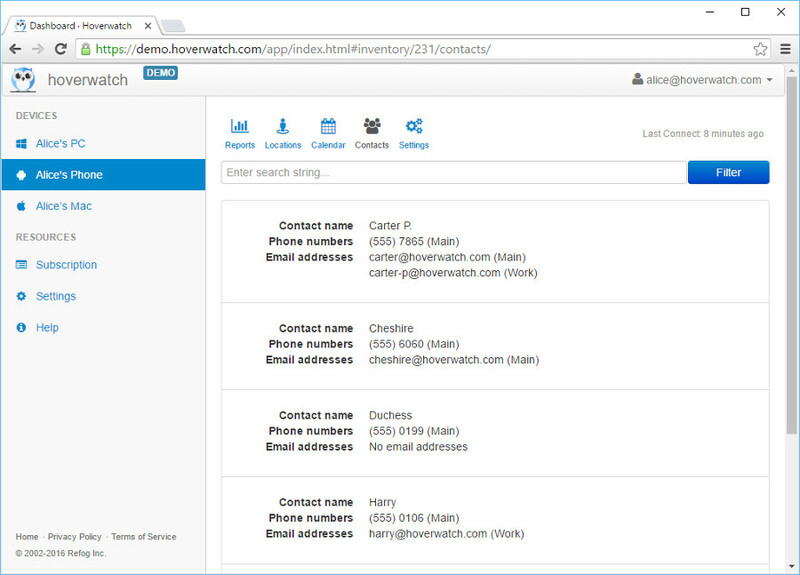 Besides the list of contacts, the software saves any possible interactions with these contacts. First and foremost, the software is used to get voice calls data. Detailed information on the calls is saved while the calls are being recorded. Moreover, this cell phone tracking software saves SMS, MMS, WhatsApp and Facebook text messages. You don’t have to receive the root on the target device to save this information. When tracking someone’s smartphone activity, it’s very useful to know the actual names of the conversation partners and not just their phone numbers. Moreover, additional information, such as e-mail address is valuable information when you want to know who your employees or children are talking to. When you want to protect your children from harm, it’s essential to know as much information as possible.